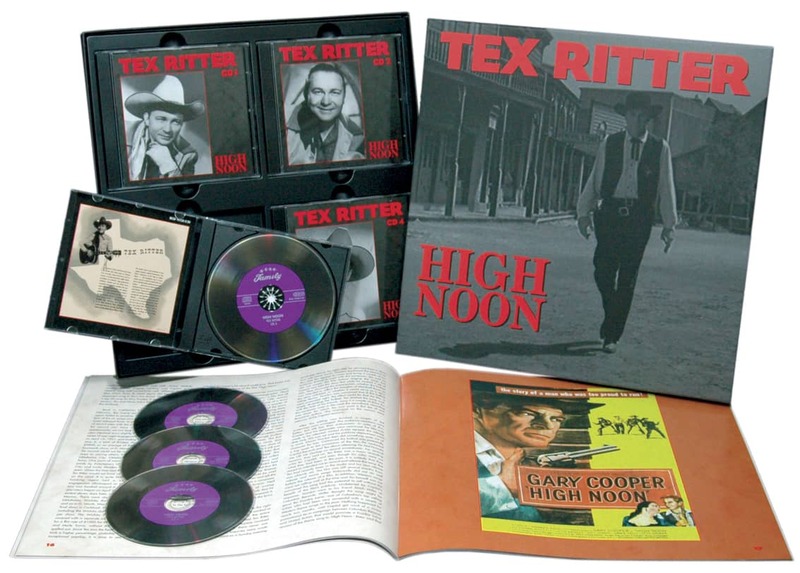 4-CD box (LP-size) with 48-page book, 111 tracks. Playing time approx. 268 mns. 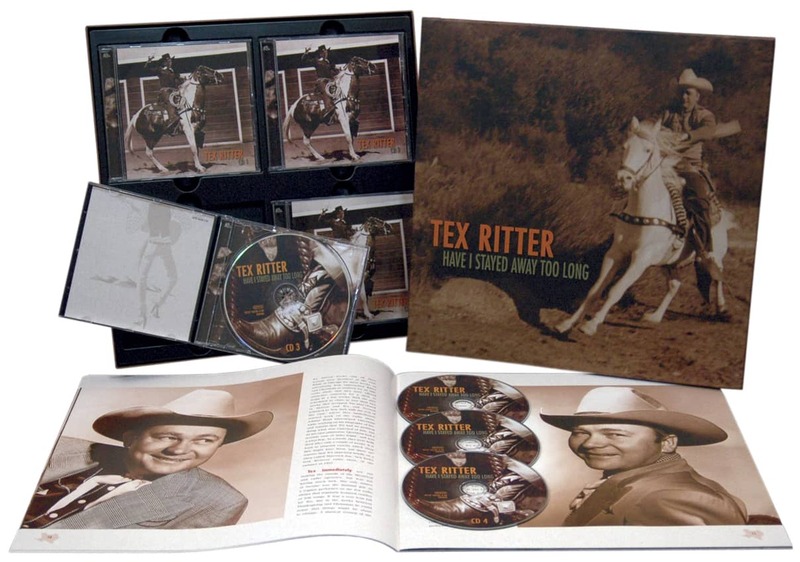 The four CDs that make up this collection contain what many feel is the best work Tex Ritter ever did. 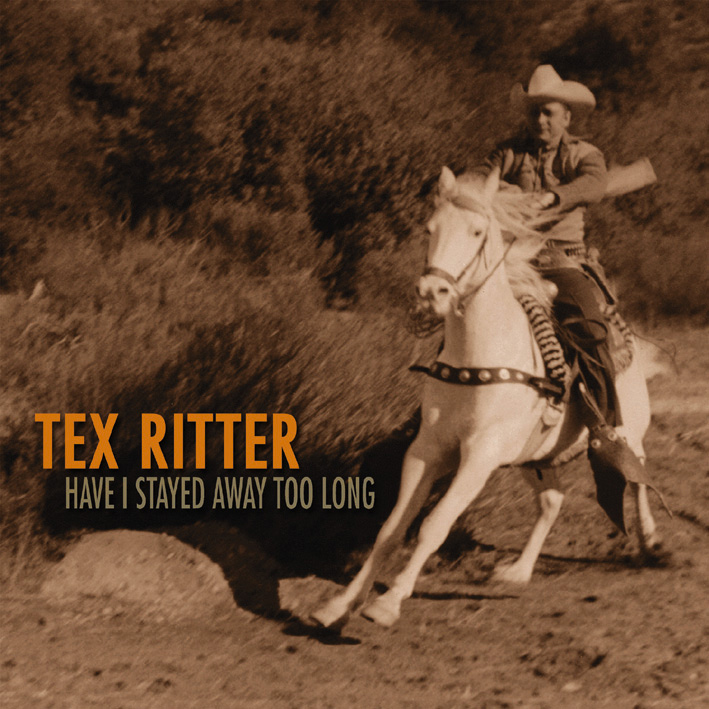 In nine recording sessions for Capitol Transcriptions over a period of two and a half years (1945-1947), Ritter mixed Western Swing and contemporary country songs with the traditional Cowboy ballads to which he was so closely identified to produce a wonderful compendium of West Coast country music of the era. 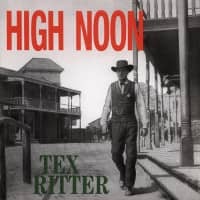 Backed by such fine musicians and friends as Merle Travis, Johnny Bond, Wesley Tuttle, Margie Ann 'Fiddlin’ Kate' DeVere and Cliffie Stone, among many others, Tex Ritter achieves a relaxed performance seldom found in the high pressure sessions of commercial recording. As a bonus his 12 songs for World Transcriptions have been added. It can be argued that there has never been a medium as important to the development and spread of a genre of music as radio was to country music. Beginning in the earliest stages of radio's development, country music, or 'hillbilly' as it was called in the twenties and thirties, was a staple of programming for most stations away from the large metropolitan areas. In the early days, the music came from local bands and singers performing live. In 1922, a talent manager complained "Everybody wants to get on the air. Everyone who can twang or pick or scrape a string, every person who can touch or pound a keyboard, and anyone at all who is not tongue-tied has become possessed with the idea that he must get on the radio." As the novelty of radio began to wear off, the listeners became more discerning and programmers more sophisticated. Only the best and most talented of the local entertainers were able to stay on the air because the advertisers listened to their audience and refused to support the less talented. Then in the mid-twenties, a couple of phonograph record companies tried a daring experiment: sending producers into the South to record some of the local 'hillbilly' singers and string bands in hopes of building a market with the hillbilly folks. 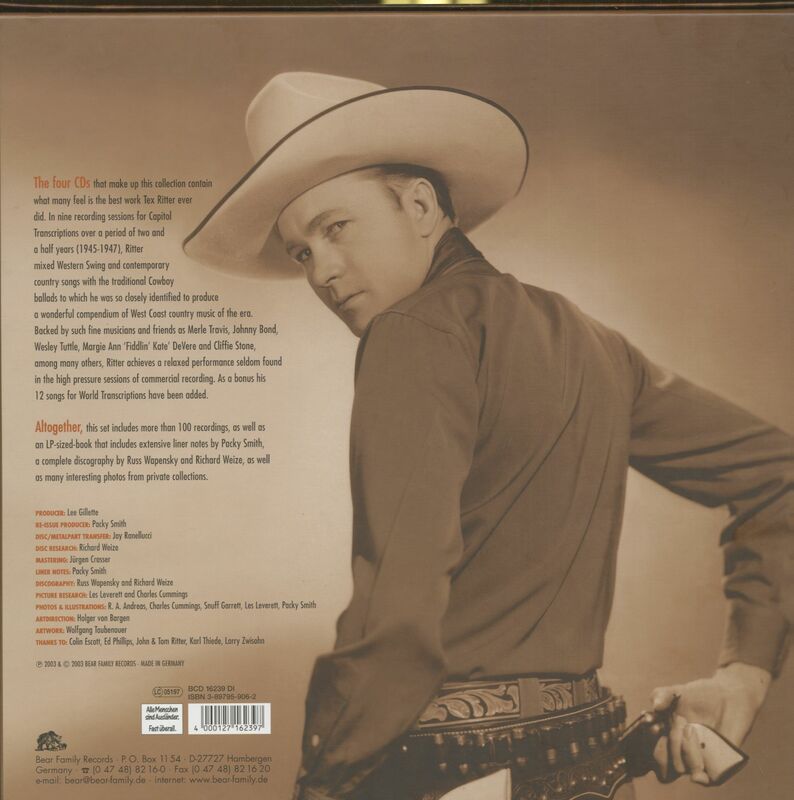 The immediate result was a series of sectional, or regional, hit records, as well as the emergence of country music's first superstar, Jimmie Rodgers. The long-term effect was to create a demand for the services of the more popular hillbilly performers on the stations in the larger markets causing a shortage of quality talent for local programs on stations in the smaller markets. The obvious solution for the smaller stations was the least satisfying in the beginning; that was playing recorded music, the commercial 78rpm records. The initial problem was that the surface noise was such that the listener was instantly aware he was listening to a recording. But that was only a problem when the station was actually able to obtain a record to play. In the 1920s and 1930s, the record companies refused to license their records for broadcast. Their fear was if the audience could get it for free, they would not be so interested in buying the record, or, as the jukebox became the biggest outlet for records during the war years, wouldn't spend the money to listen to it. Many record dealers however, quickly realized that just the opposite was true. Airplay was the best method of promotion; in fact, in many towns and cities, local record dealers would give a radio station recent records, and occasionally, even pay the announcers to play them. They believed it was a legitimate form of advertising. As the record companies began to realize that airplay actually boosted sales, they generally ignored the fact that a particular station was programming using their records; but, if asked for permission, the record companies nearly always refused. Beginning in 1922, Western Electric set out to develop a sound system for motion pictures that would fill a theater with synchronized sound. At its 1869 inception, the company provided parts and models for inventors, and, by 1881, just prior to joining the Bell System (which became AT&T in 1899), Western Electric was the largest electrical manufacturer in the United States. In the early 20th century, when a handful of companies assembled scientific researchers to expand their innovative capacities, Western Electric did so in a big way. The research branch of Western Electric's engineering department became Bell Laboratories, the greatest private research organization in the world. By 1924, Western Electric had developed a large-disc, integrated recording system and was researching sound-on-film technology. They were ready to sell to Hollywood its large-disc system to synchronize sound to film for the early 'talkies.' Western Electric and Warner Bros. formed a joint venture, the Vitaphone Corporation, to experiment in the production and exhibition of sound motion pictures. When the optical sound-on-film process replaced the transcription disc as the standard for sound films, which it did in a few short months, some entrepreneurs felt there was a future for such transcriptions in radio. The fidelity of the transcription discs was far superior to 78rpm records—much less surface noise. Radio networks were in their infancy, and programs could be sent on these discs to stations in all parts of the country to be played at the optimum time for their individual market. NBC, among the networks, was a long time holdout in allowing its stations to reschedule broadcast times by using discs, feeling that it destroyed the integrity of the network. The slower speed (33 1/3rpm) technology—developed by Western Electric—was first licensed by the World Broadcasting Service in 1929. By 1935, three other major transcription services were in business using the same technology, supplying programming to 350 radio stations around the country. Standard Radio Library, RCA/NBC Thesaurus, the C.P. MacGregor service, as well as World, were providing a basic library of radio shows complete in themselves (ready for local commercials) and a library of musical selections, along with a license to play them on the air. In addition, periodic issues of new discs and replacements would be provided. Also included was a continuity script written around the musical selections included in the library, and formed into individual shows. Some were three time a week, 15-minutes each; some are 30-minute 'across the board' (called 'strip' today) shows; some were for Sunday only, and some for a particular time slot. One library was all any one station would generally need. With one library, by using the continuity scripts provided, and using more than one staff announcer, as many as twenty to twenty-five different shows a week were available to any station. In the early 1930s, some stations began experimenting with the 'disc jockey' format using the transcriptions, but it would be the late 1940s before it became a common programming format. These libraries did not 'belong' to a radio station; they were leased for as long as the station paid the proper fees. The turntables used were large enough to accommodate the 16-inch discs, and they were dual speed. Customer evaluation for "Have I Stayed Away Too Long (4-CD)"